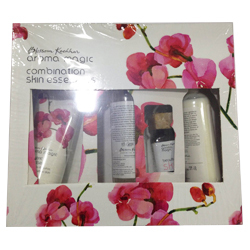 Aroma Magic Combination Skin Essentials Kit - Lighten Complexion, Deep Cleanses & Soothes, Refines & Balances Skin, Calms & revitalises. Refines, rebalances, calms and revitalise skin. The Combination Skin Essentials Kit is a 4 step process that satisfies a normal to dry/oily skin type. As some areas of the skin tend to be dry, some flaky and at the same time other parts are oily, it is especially critical to use products that suit and soothe this array of skin types as opposed to using too many variants that could make matters worse. Fortunately for you, our Combination Skin Essentials will resolve and entertain this mix of skin types to deliever suppleness and a subtle splendour to your skin. Here is a quick luxurious way to cleanse and nourish the skin while instilling a natural and healthy radiance. This kit comprises of a rich collection of moringa, turmeric and clary sage, packed with other skin loving nutrients that help refine the skin. Never before has the CTM regime been complemented with an aromatherapy blended skin oil. Follow the simple steps to leave your skin smooth, calm and revitalised. For best results, use our cleanser, toner, blended skin oil and moisturiser as their intricate composition complements one another in order to work their magic to replenish your skin.